The 4.2 ka BP Event in the Mediterranean region: an overview The 4.2 ka BP Event in the Mediterranean region Monica Bini et al. The Mediterranean region and the Levant have returned some of the clearest evidence of a climatically dry period occurring around 4200 years ago. However, some regional evidence is controversial and contradictory, and issues remain regarding timing, progression, and regional articulation of this event. In this paper, we review the evidence from selected proxies (sea-surface temperature, precipitation, and temperature reconstructed from pollen, δ18O on speleothems, and δ18O on lacustrine carbonate) over the Mediterranean Basin to infer possible regional climate patterns during the interval between 4.3 and 3.8 ka. The values and limitations of these proxies are discussed, and their potential for furnishing information on seasonality is also explored. Despite the chronological uncertainties, which are the main limitations for disentangling details of the climatic conditions, the data suggest that winter over the Mediterranean involved drier conditions, in addition to already dry summers. However, some exceptions to this prevail – where wetter conditions seem to have persisted – suggesting regional heterogeneity in climate patterns. Temperature data, even if sparse, also suggest a cooling anomaly, even if this is not uniform. The most common paradigm to interpret the precipitation regime in the Mediterranean – a North Atlantic Oscillation-like pattern – is not completely satisfactory to interpret the selected data. Bini, M., Zanchetta, G., Perşoiu, A., Cartier, R., Català, A., Cacho, I., Dean, J. R., Di Rita, F., Drysdale, R. N., Finnè, M., Isola, I., Jalali, B., Lirer, F., Magri, D., Masi, A., Marks, L., Mercuri, A. M., Peyron, O., Sadori, L., Sicre, M.-A., Welc, F., Zielhofer, C., and Brisset, E.: The 4.2 ka BP Event in the Mediterranean region: an overview, Clim. Past, 15, 555-577, https://doi.org/10.5194/cp-15-555-2019, 2019. In recent years, it has become paradigmatic that the Holocene was a relatively stable climatic epoch when compared to the last glacial period (e.g., Dansgaard et al., 1993). However, long-term, astronomically driven changes in insolation produced changes in temperature (Marcott et al., 2013, but see also Marsicek et al., 2018), associated with a progressive southward shift of the Intertropical Convergence Zone (ITCZ) and a weakening of Northern Hemisphere summer monsoon systems (e.g., Wright et al., 1993; Fleitmann et al., 2003; Braconnot et al., 2007). A number of short, multidecadal- to centennial-scale climatic events, the origin of which often remains unclear, are superimposed over this long-term trend (e.g., Denton, and Karlén, 1973; Bond et al., 1997; Mayewski et al., 2004; Wanner et al., 2011). At the regional-to-global scale, some events appear synchronous and linked to specific changes in circulation patterns (e.g., Trouet et al., 2009; Dermody et al., 2012; Zanchetta et al., 2014). A good example is the Medieval Climate Anomaly in the Atlantic region, which has been explained in terms of an anomalously persistent positive mode of the North Atlantic Oscillation (NAO) (Trouet et al., 2009). However, the synchronicity and therefore the origin of many such events remain challenging. A major and much-discussed example of a multidecadal- to century-scale event is the so-called “4.2 ka BP Event”. The detection of this event over an extensive region, and its common expression as an interval of cooling and drying (e.g., Cullen et al., 2000; Drysdale et al., 2006; Dixit et al., 2014), points to a global “megadrought” (Weiss, 2015, 2016). The significance of the climate event at 4.2 ka at the global scale has been accepted recently as the formal boundary of Late and Middle Holocene at 4250 ka b2k (http://www.stratigraphy.org/, last access: 11 March 2019). Despite its near-pervasive recognition, the timing, duration, and progression of this event have yet to be defined in detail, whilst its origin in terms of changes in ocean and atmospheric circulation remains elusive (Booth et al., 2005; Zanchetta et al., 2016; Carter et al., 2018). Moreover, not all the palaeoclimate records preserve evidence of the 4.2 ka BP Event, at least as a prominent feature of the Late Holocene (e.g., Seppa et al., 2009; Göktürk et al., 2011; Roland et al., 2014) and not necessarily as a cold and dry event (e.g., Railsback et al., 2018). Some researchers have suggested that this event is best described as a complex succession of dry/wet events, rather than a single long, dry event (Magny et al., 2009; Railsback et al., 2018), further complicating the matter. The Mediterranean region shows some of the most consistent evidence of the 4.2 ka BP Event. It is mostly recognized as a dry interval and is identified in pollen records (e.g., Magri and Parra, 2002; Di Rita and Magri, 2009; Kaniewski et al., 2013), speleothems (Drysdale et al., 2006; Cheng et al., 2015; Zanchetta et al., 2016; Finné et al., 2017), lakes (e.g., Zanchetta et al., 2012b), and marine sediments (e.g., Margaritelli et al., 2016). However, the chronology of the event is not precisely defined and, in many records, the event is not evident (Finné et al., 2011), challenging the view of a generalized period of significant drought. In this paper, we review the evidence, nature and chronology of the 4.2 ka BP Event in the Mediterranean region by comparing different marine and terrestrial proxy records. This will serve to identify gaps in the regional coverage, to expose aspects that should be addressed in future research on this topic, and to determine if coherent regional/subregional climatic patterns are present, what their links are to regions further afield, and if such patterns can be plausibly explained in a coherent meteoclimatic framework. Figure 1Location of selected records discussed in the text. For the numbers and references, refer to Table 1. The dotted red line corresponds to the limit of the growth of olive trees, taken as a rough indication of Mediterranean climate. In this paper, we use the term “4.2 ka BP Event” to indicate a period of time between approximately 4.3 and 3.8 ka cal BP (close to the definition of Weiss (2015, 2016), whilst being mindful that this does not necessarily correspond to the true temporal evolution of the climatic event but the chronological interval where often this event is recognized. We have considered a large set of records for this review. In the end, the records selected for inclusion are those possessing robust age models and high-resolution time series (i.e., at least subcentennial). It has been recognized that chronology for some Mediterranean records could be problematic, as demonstrated, for instance, using tephra layers as chronological points (Zanchetta et al., 2011, 2016, 2018). However, in the absence of these chronological control points, the question of exclusion or inclusion of records involves a degree of subjectivity. For example, we argue that only records dated by radiocarbon using terrestrial remains should be selected. Marine records dated using radiocarbon on foraminifera can show millennial-scale change of the reservoir effect (Siani et al., 2001), and different degrees of bioturbation, which can complicate comparisons between different archives. Some speleothem records, dated in the past with uranium–thorium (U–Th) methods, have chronologies inconsistent with more recent accurate age determinations (e.g., Grotta di Ernesto; McDermott et al., 1999; Scholz et al., 2012). However, to have a wide regional coverage with proxy records, we have also included records with relatively low resolution and with age control that is not necessarily optimal. With this in mind, we are also aware that our selection of records could appear incomplete for some archives/proxies. Among a copious number of data showing, even if with different expression, the 4.2 ka BP Event and its impact in the Mediterranean Basin (e.g., Magny et al., 2009; Margaritelli et al., 2016; Blanco-Gonzalez et al., 2018), we have decided to select only the proxies that can give, in our opinion, more complete information on the hydrological variability like oxygen isotope composition of continental carbonates (e.g., Roberts et al., 2010) and on the temperature conditions at regional scale, as reconstructed by pollen data and marine proxies (Jalali et al., 2016; Kaniewski et al., 2018). It is obvious that many archives are suitable for a multiproxy approach, but some proxies can be related more to local processes and correlate with climatic variables less directly than others can. Moreover, it would be useful to use similar proxies in different environments, even if they do not necessarily have the same meaning (Roberts et al., 2010). We must also consider that the scale and longevity of human activity around the Mediterranean may create locally serious difficulties in distinguishing climate change from human impact (e.g., deforestation, erosion) in many proxy records of past environmental change (England et al., 2008; Roberts et al., 2004, 2010). The 4.2 ka BP Event in the Mediterranean (including the Levant) is strictly related to complex societal evolution and development at the basin scale (Weiss, 1993; Zanchetta et al., 2013), and care is necessary in interpreting proxy records where local factors override regional climate changes. Pollen records are surely one of the most important sources of information on past environment in the Mediterranean and they will be used in this review, but they are one of the proxies that have been suggested to be seriously compromised by human activity (e.g., Roberts et al., 2004; Fyfe et al., 2015, 2018). Given the importance of having estimates of past temperature and precipitation reconstruction, we have selected pollen-based quantitative reconstructions (e.g., Peyron et al., 2017). In terrestrial archives, in addition to pollen data, we selected the oxygen isotope composition of lacustrine carbonates and speleothems as the main proxies of past climate due to their potential for preserving strong hydrological signals (Bar-Matthews et al., 1996; Roberts et al., 2008, 2010). For marine records, sea-surface temperature (SST) reconstruction was preferred to oxygen isotope composition of planktonic foraminifera, for the unavoidable limitation of the latter to represent the mixing signal of temperature and changes in local seawater isotopic composition (i.e., salinity). These are the main proxies considered for our reconstruction: they show the largest coverage and the most complete, in our opinion, climate information. These proxies also permit, to some extent, the disentanglement of climate signals between the cooler and warmer seasons, as we will propose. We are aware that there are limitations in this, but it is necessary to understand more details about the 4.2 ka BP Event. There are other proxies which can give potentially further important information, like lake-level changes (Magny et al., 2007, 2011) and, although discontinuous, isotopes on paleosols (Zanchetta et al., 2000, 2017) or paleofloods (Zielhofer and Faust, 2008). Although rare, dust records appear of particular relevance in informing about past circulation patterns and hydrological conditions (e.g., Zielhofer et al., 2017b). However, these records still have low regional coverage and will only be referred to briefly in the discussion. Table 1 and Fig. 1 show the complete list of selected records, including the original references and the proxies considered. Table 1Sites and proxy records selected in this paper for investigating the 4.2 ka BP Event. Resolution is reported only for selected proxies and is intended as the average during the Holocene. * Average resolution during the Holocene. Figure 2Selected speleothem δ18O records. For location, refer to Fig. 1 and for references to Table 1. The number of speleothem records covering the Holocene with appropriate resolution has dramatically increased in recent years, although they are geographically unevenly distributed (e.g., McDermott et al., 2011; Deininger et al., 2017). Multiple proxies obtained from speleothem calcite are often interpreted as hydrological indicators and, in particular, the oxygen isotope composition (δ18O) is the most common proxy utilized (Lachniet, 2009). In the Mediterranean Basin, in many instances, the δ18O records are seen as an indicator of the amount of precipitation recharging the cave (the so-called “amount effect”; Bar-Matthews et al., 1996; Bard et al., 2002; Zanchetta et al., 2014; Finné et al., 2017), with higher (lower) δ18O values of calcite indicating drier (wetter) conditions. This is true only when considered in terms of long-term changes in the isotopic composition of seawater sources of the precipitation (“source effect”; e.g., Cheng et al., 2015). The interpretation of the δ18O record as an indicator of hydrological changes is supported, in some instances, by other proxies like trace elements (Drysdale et al., 2006; Regattieri et al., 2014; Wassenburg et al., 2016) which should be more common in the future. More refined interpretations indicate that the δ18O composition of cave recharge is in some cases related to NAO (Smith et al., 2016; Wassenburg et al., 2016), even if investigations of δ18O composition of precipitation do not always reproduce a fidelity with NAO pressure patterns (Field, 2010; Baldini et al., 2008). Dominguez-Villar et al. (2017) suggest that most of the isotopic signal in Iberian speleothems is not principally related to the amount of precipitation but rather to changes in the ratio of recycled precipitation, and is correlated to pressure patterns over the North Atlantic. Therefore, some authors suggest that the δ18O of the speleothem calcite is a direct expression of the North Atlantic influence and state, especially in the western Mediterranean (e.g., Smith et al., 2016; Wassenburg et al., 2016) during winter months. However, a change in provenance of precipitation (Holmes et al., 2010) and precipitation amount during winter and summer months can further complicate the interpretation of the δ18O records. Therefore, a unifying and completely satisfactory explanation for δ18O of calcite is probably not yet available throughout the Mediterranean area and surrounding regions (Moreno et al., 2014). It is important also to remember that the δ18O signal is skewed towards the period of calcite precipitation and its relation with cave recharge. As anticipated, the authors tend to assume that most of the cave recharge occurs during winter (or autumn–winter) and most of the δ18O signal should be related to this condition (Deininger et al., 2017). In some instances, the complex interpretation of δ18O as a direct climatic proxy has led different authors to prefer δ13C of speleothem calcite as a better hydrological indicator of local conditions (e.g., Genty et al., 2006; Göktürk et al., 2011). The number of factors influencing the final δ13C value of a speleothem (e.g., Mühlinghaus et al., 2009) make this proxy probably just as, if not more, complicated as δ18O, and in addition, for the strong influence of soil-CO2 production on the final 13C∕12C ratio on speleothems, a change in land use and deforestation can have a particularly prominent effect, making it particularly sensitive to human impact above and within the cave. It is usually reported that speleothems possess a superior chronology compared to other archives thanks to the U–Th technique (e.g., Richards and Dorale, 2003). However, this assumption is strictly true for speleothems acting as a closed system for the uranium (Bajo et al., 2016) and with only minor clastic contamination (Hellstrom, 2006). For this review, we have selected 16 records (Fig. 2; Table 1). The main reason for excluding some records is the presence of long hiatuses (thousands of years) over the 4.2 ka BP Event that may not necessarily relate to climatic conditions, e.g., Villars, Chauvet, and La Mine caves (Genty et al., 2006) and Carburangeli Cave (Frisia et al., 2006). Some records have been rejected for their U–Th chronologies, as shown in later studies (e.g., Savi Cave; Frisia et al., 2005), with ages disputed in Belli et al. (2013). However, shorter hiatuses coherent with isotopic changes are considered here as evidence of particularly dry and potentially cooler climate conditions (i.e., Mavri Trypa Cave; Finné et al., 2017). In this regard, Stoll et al. (2013) interpreted the growth cessation of many speleothems at approximately 4.1 ka in northwest Spain to be caused by increased aridity since this time. However, this is a general signal and not specifically related to a short interval, suggesting that eventual increasing in aridity during the 4.2 ka BP Event is within a general frame of increasing aridification. The oxygen isotope composition of lacustrine carbonates in the Mediterranean region is usually interpreted as mainly being controlled by changes in the isotopic composition of lake water (Roberts et al., 2008), which is controlled by different factors, including changes in the isotopic composition of precipitation and the degree of evaporation (Zanchetta et al., 2007b; Leng et al., 2010a). Each lacustrine setting has a different set of responses and different water 18O enrichment (Roberts et al., 2008; Leng et al., 2010a, b) due to evaporative effects, which depend on several factors, namely temperature, relative humidity, wind fetch and strength, and residence time of body water (e.g., Craig et al., 1965). Different types of carbonates (e.g., ostracods, freshwater shells, bio-induced carbonates) may precipitate during different parts of the year, with bio-induced calcite (endogenic) often related to spring–summer algal bloom (Leng and Marshall, 2004). Therefore, the δ18O of endogenic carbonate will tend to be weighted towards the summer conditions, although care is necessary for their interpretation and more complex options have been proposed (e.g., Zielhofer et al., 2018). Endogenic carbonates can be contaminated by clastic carbonates (Leng et al., 2010b) and/or early diagenetic minerals (i.e., siderite; Lacey et al., 2016), which can degrade the paleoclimate signal and must be carefully evaluated case by case. Despite these possible complications, trends toward higher (lower) δ18O values are generally explained as an indication of drier (wetter) conditions (Zanchetta et al., 1999, 2007b; Roberts et al., 2008; Leng et al., 2010a, 2013). Reduction in general lake recharge and particularly arid conditions during the warmer part of the year favor higher δ18O values of endogenic carbonate. As is the case of speleothem records, lacustrine δ18O records are unevenly distributed over the Mediterranean Basin (Fig. 1, Table 1) and this represents an important limitation to regional interpretations. Following the list proposed in the important review of Roberts et al. (2008), very few new lacustrine records have been added since, e.g., Lake Ohrid (Lacey et al., 2015), Lake Prespa (Leng et al., 2010a, 2013), Lake Yammouneh (Develle et al., 2010), Lake Shkodra (Zanchetta et al., 2012b), and Sidi Ali (Zielhofer et al., 2017a). Some of the records reported in Roberts et al. (2008) and some new records that were too short or with too-low resolution or poor chronologic accuracy (e.g., Lake Pergusa, Zanchetta et al., 2007b; Valle di Castiglione, Zanchetta et al., 1999; Lake Yammouneh, Develle et al., 2010) have been excluded from this review. We have to note that some records (particularly in the past) used different kinds of organic matter and carbon (i.e., shells) for radiocarbon dating (e.g., Baroni et al., 2006), which can be affected by different reservoir and hard-water effects of unknown amount, leading to significant offsets between records. Figure 3 shows the selected lacustrine records. Figure 3Selected lacustrine δ18O records. For location, refer to Fig. 1 and for references to Table 1. For marine records, we selected SST. Figure 4 shows a compilation of 12 published SST records from coastal and deep-sea sites of the Mediterranean Sea. Apart from Fig. 4b, which is based on the Mg∕Ca ratios in planktonic foraminifera Globigerina bulloides, all the records are based on alkenone paleothermometry. As for other archives, the comparison of multiple proxies and site compilation require consideration of potential seasonal biases (Emile-Geay et al., 2017). Maximum production of alkenones in the Ligurian, Alboran, and Adriatic seas would take place mainly in spring and autumn (Ternois et al., 1997; Totti et al., 2000; D'Ortenzio and Ribera d'Alcalà, 2009), while in other sub-basins, such as the Balearic Sea and the Bannock Basin, primary production exhibits a less clear pattern, with maximum algal blooms during spring (D'Ortenzio and Ribera d'Alcalà, 2009; Ziveri et al., 2000). However, several high-resolution alkenone-derived SST records, which overlap with the post-industrial period and allow comparison with SST observations, highlight a consistent match between alkenone SST and average annual sea-surface temperature (Sicre et al., 2016; Jalali et al., 2018; Nieto-Moreno et al., 2013; Moreno et al., 2012; Cisneros et al., 2016). The single Mg∕Ca SST record from the Alboran Sea is mainly believed to reflect spring SSTs (Jiménez-Amat and Zahn, 2015). Cisneros et al. (2016) observe that modern regional oceanographic data indicate that Globigerina bulloides Mg∕Ca is mainly controlled by SST of April–May related to the primary bloom productivity. Figure 4Selected SSTs (∘C). For location, refer to Fig. 1 and for references to Table 1. The selection of pollen data is probably more complex considering the elevated number of the sedimentary successions analyzed over the basin and in different settings (marine and lacustrine cores). Using only records with acceptable resolution (i.e., resolution chronologically higher than the interval considered; Peyron et al., 2017), with the reconstruction of precipitation and temperature, the number of records is, however, strongly reduced. The basic assumption in the pollen-based climate reconstructions (assemblage approach or transfer function) is that modern-day observations and relationships can be used as a model for past conditions and that the pollen–climate relationships have not changed with time (Birks, 2005). Among the main approaches available to quantitatively reconstruct past climate from pollen data, most of the selected records have been performed using the modern analogue technique (MAT) (Guiot, 1990), an “assemblage approach” frequently used in climate reconstructions. This method was successfully used for the Holocene climate reconstructions from terrestrial and marine records (e.g., Peyron et al., 2011, 2017; Mauri et al., 2014, 2015). MAT is based on a comparison of past assemblages to modern pollen assemblages. An important requirement is the need for a high-quality training set of modern samples. The training set should be representative of the likely range of variables, of highest possible taxonomic detail, of comparable quality and from the same sedimentary environment (Brewer et al., 2013). It must cover a wide environmental range. Limitations of using MAT are the occurrence of no analogues or multiple analogues (Birks et al., 2010), and the potential problem of the spatial autocorrelation with MAT but also in the transfer functions (Telford and Birks, 2005). All these interpretations hold if minor human impact is considered in vegetation and pollen production, which may be a major concern for some reconstructions (Fyfe et al., 2015, 2018). Figure 5 shows the reconstructed temperatures (annual) and precipitation (annual, winter, and summer) through the 4.2 ka BP Event. Figure 5Selected temperature (T, ∘C) and precipitation (P, mm year−1) records obtained from pollen records. Tma: mean annual temperature; Pma: mean annual precipitation; PS: average summer precipitation; PW: average winter precipitation. For location, refer to Fig. 1 and for references to Table 1. Figure 6Compilation of pollen records containing the Avellino tephra layer (dated at approximately 3.8 ka; for review, see Zanchetta et al., 2018). All the records are plotted with their original age model: Lago dell'Accesa (Drescher-Schneider et al., 2007); Lago di Mezzano (Sadori, 2018); Lago Albano and Lago di Nemi (Mercuri et al., 2002); RF93-30 (Mercuri et al., 2012). For core RF93-30, the correlation with Avellino tephra is not certain (Lowe et al., 2007). The first general observation is that, for many of the records, chronological uncertainties and different, and sometimes poor, chronological resolution are the main obstacles in the precise identification of the event, its timing, duration, and progression. At this stage, both aspects seem to be an unavoidable limitation for an in-depth understanding of this interval. For example, we show selected pollen records (arboreal pollen, AP %) containing the Avellino tephra plotted with their published age model (Fig. 6) in the central Mediterranean. Quite apparent are the century-scale differences in age models presented, considering the well-constrained ages of this tephra layer (approximately 3.8 ka; see discussion and references in Zanchetta et al. (2018). It is reasonable to assume that similar levels of uncertainties may be present in other records. We note that, in Fig. 6, the identification of the 4.2 ka BP Event appears problematic (at least using AP % signal), which is not in the case for other pollen records in Italy (Magri and Parra, 2002; Di Rita and Magri, 2009; Di Rita et al., 2018a), the Iberian Peninsula (e.g., Blanco-Gonzalez et al., 2018; Lillios et al., 2016), or the Levant (e.g., Kaniewski et al., 2013, 2018). Interestingly, some records may suggest that the 4.2 ka interval is characterized by several important oscillations rather than one simple long interval of specific (usually drier) climatic conditions (see, for instance, Skala Marion and Solufar or GLD1 in Fig. 2, or SST in the Gulf of Lion and Alboran Sea in Fig. 4), as it has been suggested for other parts of the world (Railsback et al., 2018) and in this issue (Kaniewski et al., 2018). However, there is no clear and coherent evidence of this in many of the different selected records. A good example of the complexity of the evidence and the link to chronological accuracy is the lake-level record at Lago dell'Accesa. This was used as the archetypal example to demonstrate that, in reality, the event is “tripartite” (Magny et al., 2009), where a phase characterized by drier conditions at approximately 4100–3950 cal BP appeared bracketed by two phases marked by wetter conditions and dated to approximately 4300–4100 and 3950–3850 cal BP, respectively (Magny et al., 2009). Magny et al. (2009) reported a significant number of records over the Mediterranean showing reasonably the same climatic evidence. However, subsequent works using tephra layers (Avellino and other tephras are present in Lago dell'Accesa; Magny et al., 2007) showed the inconsistency of this detailed correlation, and the 4.2 ka BP Event should be dominated by lower lake level (Zanchetta et al., 2012a, b, 2016), supporting the existence of a prominent drier phase. To circumvent some of the complex issues related to chronological problems, the authors have used two different approaches. The first, and the most common, is an accurate selection of records which show conspicuous and chronologically consistent evidence of the event (e.g., Drysdale et al., 2006; Magny et al., 2009; Kaniewski et al., 2018). Records in which the expression of the event is equivocal are usually removed. A different approach is more “climatostratigraphic”, which is used instead of a simple chronological selection of a time window to correlate the event on the basis of similarity of the climatic curve. This has the obvious limitation that any regional articulation and/or timing progression will be lost. For instance, we can force the correlation of Skala Marion δ18O record with those of the Renella, Mavri Trypa, and Solufar caves (Fig. 7; for instance, Psomiadis et al., 2018, implicitly followed this approach in their Fig. 6, for Skala Marion, Renella, and Solufar cave records), to assume that the interval at approximately 3.9–3.4 ka characterized by higher δ18O values at Skala Marion corresponds to a similar interval at approximately 4.3–3.8 ka that is well identified in Renella and Mavri Trypa. Therefore, we are aware that the chronological issue can heavily contaminate the following discussion. In the following sections, we separate proxies on the basis of their presumed meaning: annual average vs. seasonal component. Maps are produced (Fig. 8) specifying the local record condition (i.e., warmer/cooler and/or drier/wetter). For reasons that may depend on chronology, proxy sensitivity, and/or local response to climatic change, it is not always obvious to define the specific environmental conditions of the considered interval. In some instances, changes lasted longer than the interval considered, or during the interval there is a clear change in conditions, or the interval is characterized by invariant conditions and/or by trends. Once again, some margin of subjectivity may have existed in the evaluation of a single record. Generally, for each site, if most of the interval is dominated by specific conditions (wetter, drier, colder, and/or warmer), this is represented in the maps accordingly. If the environmental trend moves toward a specific state, the site is defined by this trend (e.g., if the trend during the interval is toward drier conditions, the site is deemed “drier” during the event). Ambiguities are still possible and are indicated where appropriate. Based on SST and pollen reconstructions, it is possible to gain some insights on the average conditions during the 4.2 ka interval (Fig. 8a and b). As can be seen from Fig. 4, SST records from 8000 to 2000 BP show strong differences in their temporal resolution. Some poorly resolve the 4.2 ka BP Event (e.g., Fig. 4d, e). 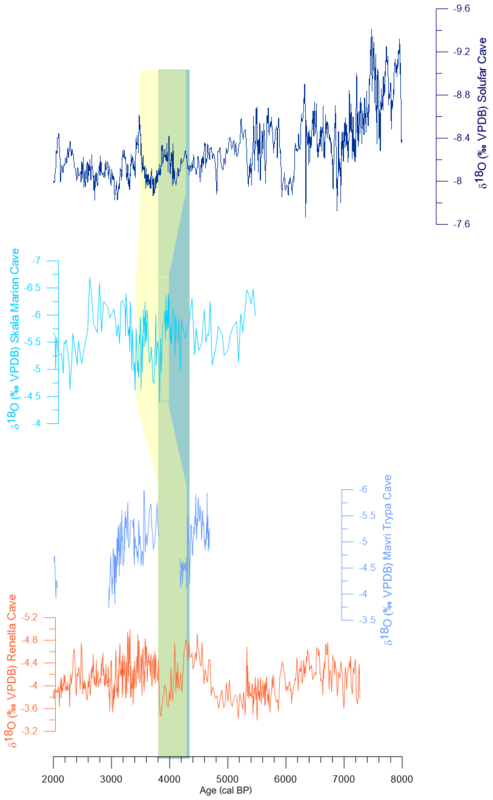 In the Alboran Sea cores, MD95-2043 and ODP-976 show substantially invariant alkenone temperatures, despite their rather high resolution, whereas the Mg∕Ca SSTs record from the Alboran Sea (ODP-976, Fig. 4b; Jiménez-Amat and Zahn, 2015) documents a cooling during spring rather than the mean annual conditions. The cooling in the Alboran Sea has been confirmed by high-resolution Mg∕Ca SST by Català et al. (2018). The alkenone SSTs from the Gulf of Lion (Jalali et al., 2016) (Fig. 4c) indicate several SST oscillations with some important cooling in the final part of the interval. BS79-38 in the Tyrrhenian Sea (Fig. 4d) shows essentially invariant SSTs, whereas in the Ionian Sea, cores M25/Kl11 and M40/4-SL78 (Fig. 4f), despite their low resolution, show an opposite trend. In the Adriatic Sea, an apparent modest warming is present only in core AD91-17 (Giunta et al., 2001). In the Levantine Basin, an apparent general tendency for cooling seems to be present in core GeoB7702-3 (Fig. 4g) (Castaneda et al., 2010), after a phase of warming even if the interval considered comprises the descending part of a longer SST trend. In the Nile prodelta area, a warmer interval seems to be present in core MD04-2726 (Fig. 4h) (Jalali et al., 2017), even if with some oscillations. Figure 5 shows reconstructed annual average temperatures in different parts of the basin using pollen records. Most of the central Mediterranean records (except Lago Trifoglietti, which shows some intermediate behavior, with a tendency of warming) show a cooling at this time. Lake Maliq shows a long-term cooling, rather a precise interval of cooling. In contrast, in the Acre record, there is first a period of warmer conditions, followed by a later period with a prominent cooling, and this trend, according to Kaniewski et al. (2018), is consistent with other sites in the eastern Mediterranean. Figure 8a shows that the few records selected show generally lower average temperatures in the western–central Mediterranean, whereas towards the eastern part higher temperatures seem to prevail. Annual precipitation estimated from pollen shows several records with clear evidence of reduced precipitation (Maliq, Lake Pergusa, Lago Trifoglietti, Acre), even if this signal is generally complex (Fig. 5), with part of the selected records not suggesting drier conditions (e.g., Malta, SL152, MD95-2043). Indeed, Fig. 8b highlights that poor data coverage for estimating past annual precipitation prevents any detailed considerations. Figure 7Chronologic approach (green field) and climatostratigraphic approach (yellow field) applied on speleothem records (based on Psomiadis et al., 2018): Renella Cave (after Zanchetta et al., 2016); Mavri Trypa Cave (after Finné et al., 2017); Skala Marion Cave (after Psomiadis et al., 2018); Solufar Cave (after Göktürk et al., 2011). Figure 8Maps of (a) annual average temperature, (b) annual average precipitation, (c) winter precipitation, and (d) summer precipitation. See Figs. 2–5 and Table 1 for data. Circles indicates data from pollens, lozenges indicate data from alkenones, squares indicate data from speleothems, and triangles indicate data from the lake. Meaning of filled symbols: blue indicates colder conditions, red indicates warmer conditions, yellow indicates drier conditions, green indicates wetter conditions, and grey indicates unchanged conditions; unfilled symbols: symbols with a red border indicate likely warmer conditions, those with a yellow border indicate likely drier conditions, and those with a green border indicate likely wetter conditions. In this reconstruction, we have included speleothems and pollen data, whilst being aware of the limitations discussed in Sect. 2.1.1 and 2.1.4. Most of the records indicate drier conditions in winter during the 4.2 ka BP Event. Speleothems are the most conspicuous record. Qualitatively, 6 out 15 records show that during the considered interval there is a clear increase in δ18O values (Fig. 2; Jeita, Ascunsa, Poleva, Mavri Trypa, Renella, and Gueldaman caves). Soreq and Corchia can be added to this group (stalagmite CC26), showing a modest increase of values at that time. Two caves (Grotte de Piste and Kaite) show a clear interval of decreasing δ18O values (Fig. 2). Solufar and Skala Marion show a similar pattern of oscillating behavior, with an important part of the period characterized by a marked decrease in the δ18O values. A similar, but not identical, pattern is present in the Iberian caves, Ejulve and Cueva de Asiul. Invariance defines the Grotta di Ernesto record. This apparently contradictory behavior is regionally well defined with the central Mediterranean (Algeria, central Italy, Romania, and western Greece) and part of the Levant, characterized by the most marked and significant interval characterized by higher δ18O values. Instead, the north Iberian Peninsula and north Morocco show a tendency to lower or oscillating values, as does the opposite end of the basin with the records from the Solufar and Skala Marion caves. Accepting the fact that δ18O represents the amount of precipitation during the winter recharge period, we observe that the central part of the basin, with some extension to the Balkans and Romania, shows decisively drier conditions compared to the other analyzed sectors, where they show wetter or at least more variable conditions. Winter precipitation reconstructed from pollen shows clear indications of decreased precipitation at Ledro, Lake Pergusa, MD90-917, and MD95-2043 (even if modest). Drier conditions are evident for most of the interval at Lago Trifoglietti (with a late recovery toward wetter conditions), whereas in Malta most of the interval shows wetter conditions compared to the previous period. Lago dell'Accesa shows a strong oscillatory behavior, with the central part of the drier interval bracketed by two wetter intervals. However, the general trend of Lago dell'Accesa cannot be classified unambiguously as wetter or drier. Figure 8c shows the prevailing precipitation conditions (wetter/drier for the interval considered) during winter for the proxy in question. Geographically, it seems quite consistent that most of the Mediterranean records show drier conditions during winter. Despite the poor coverage, the possible exceptions are Morocco and the Iberian Peninsula, as well as some sectors of the eastern Mediterranean, possibly indicating a regional articulation. As discussed in Sect. 2.1.2, endogenic lacustrine carbonates can be considered reasonably as a first-order hydrological (precipitation minus evaporation) signal of summer, even if influenced by the effect of recharge during previous periods. Some records (Sidi Ali, Ohrid, Hula) show no peculiar trends during the period considered, although for a very short interval centered at approximately 4.2 ka, Zielhofer et al. (2018) observe a minor oscillation in δ18O values interpreted as increased winter recharge (Fig. 3). Other records show a clear peak towards more positive values (Medina, Frassino, Shkodra, Prespa, Dojran, Nar Gölü, Gölhisar), whereas others show a tendency to decrease values (e.g., Van) or a clear peak of lower δ18O values (i.e., Ioannina). Instead, Zeribar and Mirabad records show a trend towards lower δ18O values, even if the resolution of the two records for this interval is rather poor. A number of records show a well-marked peak of increasing δ18O values within the considered interval but show a different duration, possibly due to differences in age models and resolution. It is surprising to note that the two sister lakes (Prespa and Ohrid) (Lacey et al., 2015; Leng et al., 2010a, b, 2013) exhibit, for this interval, significantly different trends (Fig. 3). This can be explained by the effect of higher residence time and more dampened isotopic composition of the lake water at Lake Ohrid due to its large recharge by karst springs (more than 50 %; Wagner et al., 2017) in comparison to Lake Prespa (Leng et al., 2010a). This renders the latter much more sensitive to hydrological changes, as demonstrated by its dramatic lowering of lake-level changes in recent years (van der Schriek and Giannakopoulos, 2017). Regional, and consistent with Lake Prespa, are the data from Lake Dojran and Shkodra (Fig. 3), which show drier conditions. Interestingly, the Ioannina record shows a very marked phase of lower δ18O values in an almost perfect antiphase with the other nearby lakes. We note that Ioannina is a record obtained using ostracods; instead, the others were obtained by measuring the isotopic composition of endogenic calcite, which may integrate the isotopic signal of a number of years. Possibly, the Ioannina record intercepts a period of particularly pronounced snow melting in spring, while the other lakes record a significantly longer period of evaporated waters during spring/summer. Progressive trends towards lower values shown by Zeribar and Mirabad are difficult to interpret because of their relatively low resolution, although there is regional coherence. Some pollen reconstructions show evidence of drier conditions (Fig. 5; Ledro, Lago Trifoglietti, SL152-PA, and MD95-2043, even if the last is within a longer period of summer-reduced precipitation), but others indicate a tendency towards increasing precipitation and/or are decisively wetter than the previous interval (Fig. 5; Maliq, Lago dell'Accesa, Lake Pergusa, and MD95-2043). Figure 8d shows the regional pattern of the considered summer conditions. Despite the large gaps in record coverage, once again, most of the records indicate drier conditions, even if, in the central sector (Italian Peninsula and possibly some sectors of Greece) and in the eastern end, a tendency toward wetter conditions may exist. 3.5 Is a synthesis possible? The Mediterranean Basin is located in a transitional zone between north Africa and the Arabian arid regions, dominated by the subtropical high-pressure system, and central and northern Europe where midlatitude westerly circulation dominates. The basin is also exposed to the indirect effect of the Asian and African monsoons in summer and to western Russian/Siberian High systems in winter (e.g., Lionello et al., 2006, and references therein). Therefore, to look for a simple mechanism for explaining the 4.2 ka BP Event is not a simple task. The uneven distribution of many proxy records, and the previously discussed concerns on chronology, can make general conclusions and detailed regional articulation difficult. It is beyond the scope of this contribution to discuss the detailed mechanism and forcing; however, considering the discussion made in previous sections regarding the limitations of proxies and our approach in their interpretation, some interesting points emerge. Based on Fig. 8a, the average annual temperature seems to show a tendency of cooling for most of the basin. Even when moving from west to east, there seems to be an increase in the number of records showing an increase in temperature, instead of cooling, suggesting a possible coherent trend. Data for average annual precipitation are sparse and make syntheses difficult (Fig. 8b). Figure 8c shows the situation regarding winter precipitation inferred from speleothem δ18O records and pollen reconstructions. They are of particular relevance for most of the basin, which is strongly controlled by NAO, in particular in the western and central parts of the basin (Lionello et al., 2006; López-Moreno et al., 2011), with winter precipitation being negatively correlated with NAO. On the contrary, areas of the southeastern Mediterranean show an anticorrelation with western Mediterranean precipitation, resulting in a seesaw pattern known as the Mediterranean Oscillation (MO; e.g., Conte et al., 1989). This clearly opens the possibility that seemingly complex patterns in precipitation are not just an artifact of the proxies and/or chronology but can be a real and robust climatic pattern. Figure 9Selected additional records to illustrate the general situation over the basin during the 4.2 ka BP Event. Summer insolation curve at 65∘ N (Berger and Loutre, 1991); NAO index (Olsen et al., 2011); storm activity in the Gulf of Lion (Sabatier et al., 2012); Renella Cave (Zanchetta et al., 2016); Mohos peat dust flux (Longman et al., 2017); Scărişoara Ice Cave, d excess in the ice cave (Perşoiu et al., 2017); probability flood frequency from north Tunisia (Zielhofer and Faust, 2008); Sidi Ali dust flux (Zielhofer et al., 2017b); clastic input at Petit Lac (Brisset et al., 2013); Gemini Lake July temperature (Northern Apennines) (Samartin et al., 2017); Alìmini Pìccolo arboreal pollen (AP %) record (Di Rita and Magri, 2009); Calderone glacier expansion (Zanchetta et al., 2012a); Qarun Lake (Marks et al., 2018). On the other hand, the present climatic configuration can have different past regional expressions due to a combination of multiple factors. Indeed, antiphasing between different sectors of the Mediterranean Basin has been found during the Medieval Climate Anomaly and the Little Ice Age between the Iberian Peninsula and Turkey, with the latter not the present-day center of action of the MO (Roberts et al., 2012). This has also been suggested during several Late Holocene oscillations including the 4.2 ka BP Event, in antiphase in the southwestern and the south–central Mediterranean regions (Di Rita et al., 2018b). The pattern described in Fig. 8c, with the main distribution indicating pervasive drier conditions over most of the Mediterranean during winter, is consistent as a NAO-like positive mode, where westerly sourced vapor masses shift northward due to a pronounced Azores High. NAO positive mode during this period is also supported by the concentration of terrestrial n-alkanes (TERR-alkanes) in the Gulf of Lion shelf sediment (Jalali et al., 2016). However, the presence of a pole of possibly wetter conditions over Morocco (as indicated by the Grotte de Piste; Figs. 6 and 8c, and partly also by Sidi Ali) and the northern Iberian Peninsula, and a less evident and questionable wetter area in the eastern sector (Solufar and Skala Marion caves; Fig. 2), suggests a different configuration. Indeed, at Grotte de Piste, periods characterized by lower δ18O values have been interpreted as a period of negative NAO-like conditions (Wassenburg et al., 2016), which is also suggested by other authors for this period (e.g., Di Rita et al., 2018a). However, this interpretation runs counter to the speleothem evidence from central Mediterranean indicating drier conditions (Renella, Corchia, and Mavri Trypa; Drysdale et al., 2006; Regattieri et al., 2014; Finné et al., 2017). Figure 10Correlation between the December–January–February NAO index (modified after Perşoiu et al. (2018)) and precipitation amount during negative NAO conditions. A negative correlation (brown) indicates that during negative conditions precipitation amounts are lower than usual, while a positive correlation (green) indicates that, during negative NAO conditions, precipitation is above average. Yellow circles: records indicating drier conditions during winter; blue circles: records indicating wetter conditions during winter (see Fig. 8c). This is further confirmed by new speleothem data (stable isotopes and trace elements) reported by Isola et al. (2019), from Apuan Alps in central Italy. Figure 9 shows the NAO index inferred by Olsen et al. (2011); during the 4.2 ka BP Event, the NAO is mostly positive, if not particularly prominent, suggesting that NAO configuration alone would not be particularly useful to interpret this period of time. Moreover, Fig. 10 shows that a negative NAO-like configuration with a similar pattern of precipitation like today is unlikely considering the data of Fig. 8c. It is interesting to note that the distribution of Figs. 8c and 10 seems to find some similarity with the reconstruction proposed by Dermody et al. (2012) during Roman time. According to Dermody et al. 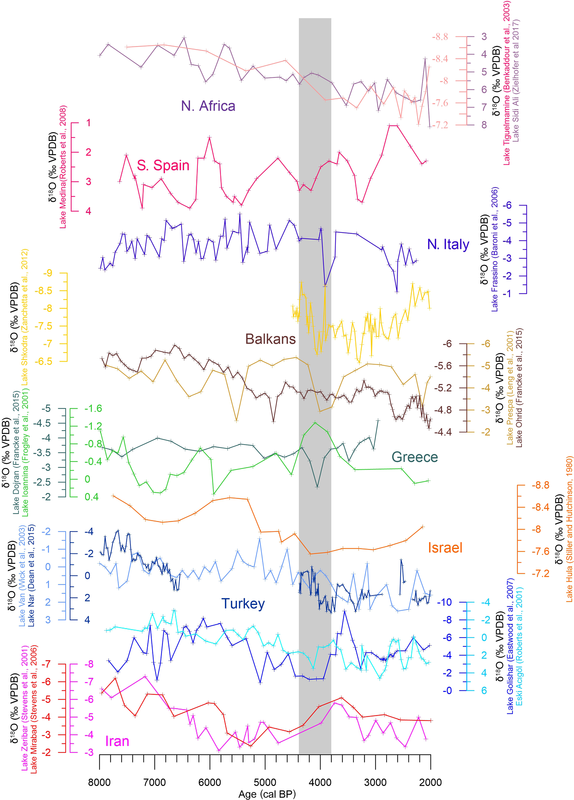 (2012), the dominant pattern of variability in humidity between 3.3 and 1.0 ka shows a seesaw pattern with Spain and Israel on one side and the central Mediterranean on the other. The patterns in climatic humidity are similar to precipitation anomalies associated with the east Atlantic/west Russia pattern, which today represents a secondary mode of precipitation pattern during winter within the dominance of the NAO pattern (Xoplaki et al., 2004). It is clear that the center of action of the seesaw pattern may have changed in time with configuration not precisely similar to today. It is interesting to note that Perşoiu et al. (2018) suggested that part of the drier and cold conditions over the Mediterranean during the 4.2 ka BP Event was caused by the strengthening and expansion of the Siberian High, which effectively blocked the moisture-carrying westerlies and enhanced outbreaks of cold and dry winds. Summer proxies (Fig. 8d) indicate a prolongation of drier conditions also during the warmer part of the years, suggesting a persistent Azores High during summer. However, in the central Mediterranean, some records indicate a possible increase of precipitation, possibly as incursions of North Atlantic perturbations, which suggests weakening of the Azores High for some areas, possibly as an effect of change in its positions (e.g., Di Rita et al., 2018b). Considering that the position of the ITCZ exerts a control on summer aridity and the temperature in the Mediterranean Basin (Eshel et al., 2002; Alpert et al., 2006; Gaetani et al., 2011), a southward shift of the ITCZ may have locally weakened the Azores High, favoring incursion of wetter air from North Atlantic. A southward shift of the ITCZ during the 4.2 ka BP Event is supported by several lines of evidence (e.g., Welc and Marks, 2014; Dixit et al., 2014), and this would have an effect on summer weather over the Mediterranean. Marriner et al. (2012) have shown a decrease in Nile Delta flood-driven accretion between approximately 4.4 and 4.1 ka in response to weakening of ITCZ, related to changes in El Niño–Southern Oscillation (ENSO)-type variability. 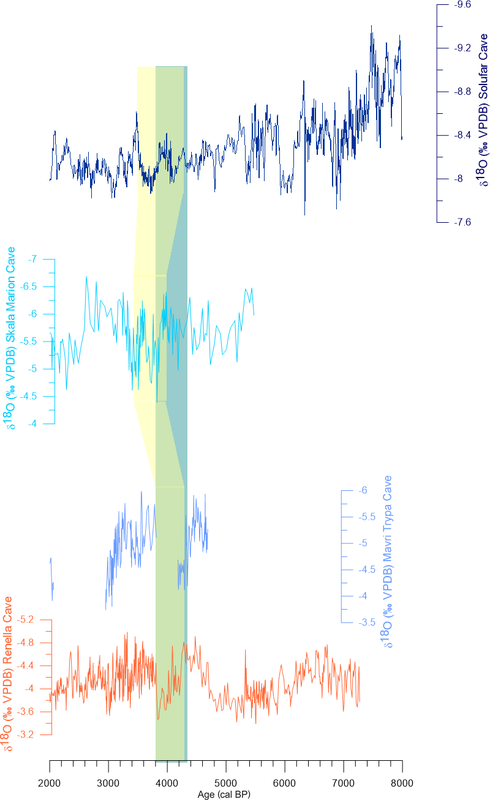 This may indicate an indirect influence of ENSO variability on climate of the Mediterranean during 4.2 ka BP Event. Brayshaw et al. (2010) discussed the influence of the position of the midlatitude westerly jet (MLWJ) over the winter precipitation in the Mediterranean. Their modeling indicates a southward shift of the MLWJ during the second part of the Holocene, with related changes in cyclogenesis over Mediterranean. The importance in the shift of the position of the MLWJ is also documented in dust proxy records from the Middle East and east Asia (e.g., Nagashima al., 2011; Sharifi et al., 2015, 2018). According to Sharifi et al. (2018), evidence from the dust record from the Neor peat mire in Iran and climate modeling shows that at approximately 4.2 ka there is a migration of the main axis of the MLWJ towards the Equator allowing the transport of higher fluxes of dust from west Asia as well as from the northeast Africa. This indicates a complex but possibly correlated interplay between the ITCZ, MLWJ, and Mediterranean precipitation. Despite evidence being weak, it is also reasonable to assume that conditions during summer are also important in defining the final “feature” of the 4.2 ka BP Event. Evidence of environmental and climatic deterioration around or coincident with the 4.2 ka BP Event is apparent but chronologically compromised considering a different selection of records (Fig. 9; see also Fig. 1 and Table 1). Reduced temperature (Fig. 8a) is also consistent with the start of the Neoglacial over the Apennines with the first appearance during the Holocene of the Calderone glacier (Zanchetta et al., 2012a). Interestingly, exposure ages in the western Alps also indicate a first “Neoglacial advance” at 4.2 ka (Le Royet al., 2017). This is geographically consistent with lower temperatures during summer, as inferred from chironomids from central Italy (Fig. 9; Samartin et al., 2017). Also, on the French side of the Mediterranean Alps, lakes show evidence of high-frequency environmental instabilities during this period. Rapid alternation of drop and rise of the lake level are suggested by a switch in the benthic/planktonic diatom ratio at Lac d'Allos (Cartier et al., 2019), while at Petit Lac, more frequent heavy rainfall triggered soil erosion (Fig. 9; Brisset et al., 2013) and ecosystem shift (Cartier et al., 2015). This complex pattern is well explained by oxygen isotope composition performed on diatom cells of Petit Lac that indicates that the period is marked by drier mean conditions (in terms of annual lake balance), associated with short-term heavy rainfall (Cartier et al., 2019) rather than just wetter conditions. This is in good agreement with the other records of the central Mediterranean. The pollen records from Alìmini Pìccolo (Fig. 9; Di Rita and Magri, 2009) and from the Gulf of Gaeta (Di Rita et al., 2018b) show a prominent decrease in AP, suggesting drier conditions. Drier conditions can be inferred also from a multiproxy record from Qarun Lake in the Faiyum Oasis (Egypt; Figs. 1, 9). In Qarun, the interval between approximately 4.4 and 4.0 ka shows an increase in aridity and dust supply, as shown by several proxies (Marks et al., 2018). In northeastern Africa, there is further evidence of climate change at about 4.2 ka associated with the collapse of the ancient Old Kingdom in Egypt (Welc and Marks, 2014, and references therein). Dust deposition increases in the Eastern Carpathians, as documented by the Mohos peat succession (Longman et al., 2017), although an increase of clastic material in a peat succession in a volcanic caldera can be explained also by an increase in local soil erosion. This phase is marked by a change in the d excess in the ice in the Scărişoara Ice Cave (Carpathian Mountains; Fig. 9; Perşoiu et al., 2017), suggesting a change in the arrival of cyclones sourced from the Mediterranean region. The dust record in Sidi Ali Lake (Fig. 9) suggests a measurable trans-Saharan aridity event, with increased dust transport at approximately 4.2 ka (Zielhofer et al., 2017b). Changes in circulation are also suggested by exotic pollen of cedar, arriving from north Africa, in some pollen successions of central Italy (e.g., Magri and Parra, 2002). Between approximately 4.4 and 4.0 ka, there is evidence for an increase in storm activity, as documented by several records in the central Mediterranean (Sabatier et al., 2012; Kaniewski et al., 2016; Marriner et al., 2017), possibly suggesting an increase of occasional strong southward incursion of westerlies. This is not in contrast with a trend towards increased flooding in central Tunisia in this period correlated with a colder period in the North Atlantic (Fig. 9; Zielhofer and Faust, 2008). 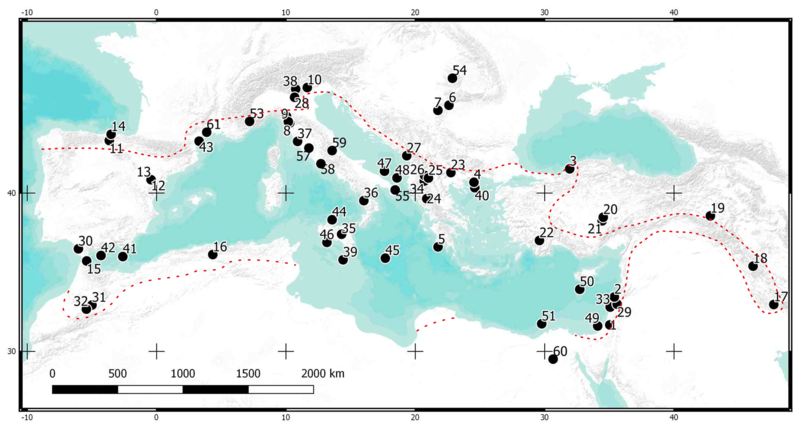 The analyses of many records show that between 4.3 and 3.8 ka climatic and environmental changes occurred in the Mediterranean Basin. In many records, it appears evident that an important change in the hydrological regime occurred, with more arid conditions, but locally this evidence is confounded. Cooling can be inferred from different records, but this is not a common feature. Despite contradictions, which is not questioning the evidence of this event, there is the possibility that it is regionally articulated as having a locally different climatic expression. This expression would be also related to different seasonal conditions. From the selected data, the possibility emerges that this event is in reality marked by some oscillations which cannot be resolved in an unequivocal way on the basis of available records. However, regional coverage is still low, even if our record selection is incomplete. The emerging patterns need to be confirmed by future research, but well-positioned and well-resolved new records can also change our view. By comparing the distribution of the selected records with one of the most important climatic modes like NAO, which impact Mediterranean climate, in particular in winter, we did not find complete and satisfying matches. We can agree that different working hypotheses investigating the role of potential climatic teleconnections can be inferred from single records or regionally well-constrained groups of records, but none seem convincing today. However, this review indicates that many pieces of this complex puzzle are still lacking. Most urgently, new records at a higher resolution with a firm chronological basis are required. The paper is a review and all the data have been collected from previous publications either on an open database or by requesting data directly from the authors. In only one case have data been digitized. In any case, they have been organized in a series of *.xls files, which can be obtained by request to MB and GZ. MB, GZ, and AP conceived the manuscript. MB and GZ organized and wrote most of the manuscript. In particular MF, RD, and II contributed to the construction and writing of Sect. 2.1.1; JRD and RC contributed to the construction and writing of Sect. 2.1.2; BJ, M-AS, IC, and FL contributed to the construction and writing of Sect. 2.1.3; OP contributed to the construction and writing of Sect. 2.1.4; FDiR, OP, DM, AM, AMM, and LS contributed to the selection and interpretation of pollen records; LM, AP, MB, FW, and CZ contributed to the selection and interpretation of different proxy records throughout the manuscript. All the co-authors participated in sharing the data and contributed to the scientific discussion. Monica Bini and Giovanni Zanchetta are indebted to the University of Pisa and Earth Science Department for the support in organizing the workshop “The 4.2 ka BP Event”. Monica Bini and Giovanni Zanchetta's contribution have also been developed within the frame of the project “Climate and alluvial event in Versilia: integration of Geoarcheological, Geomorphological, Geochemical data and numerical simulations” awarded to Monica Bini and funded by the Fondazione Cassa di Risparmio di Lucca. Leszek Marks and Fabian Welc were funded by the National Science Centre in Poland (decision no. DEC-2013/09/B/ST10/02040). Aurel Perşoiu was funded by UEFISCDI Romania, trough grant no. PN-III-P1-1.1-TE-2016-2210. Marie-Alexandrine Sicre and Bassem Jalali were financially supported by the MISTRALS/PaleoMex program. The research leading to this study has received funding from the French National Research Agency HAMOC project (ANR-13-BS06-0003). Almogi-Labin, A., Bar-Matthews, M., Shriki, D., Kolosovsky, E., Paterne, M., Schilman, B., Ayalon, A., Aizenshtat, Z., and Matthews, A.: Climatic variability during the last 90 ka of the southern and northern Levantine Basin as evident from marine records and speleothems, Quaternary Sci. Rev., 28, 2882–2896, 2009. 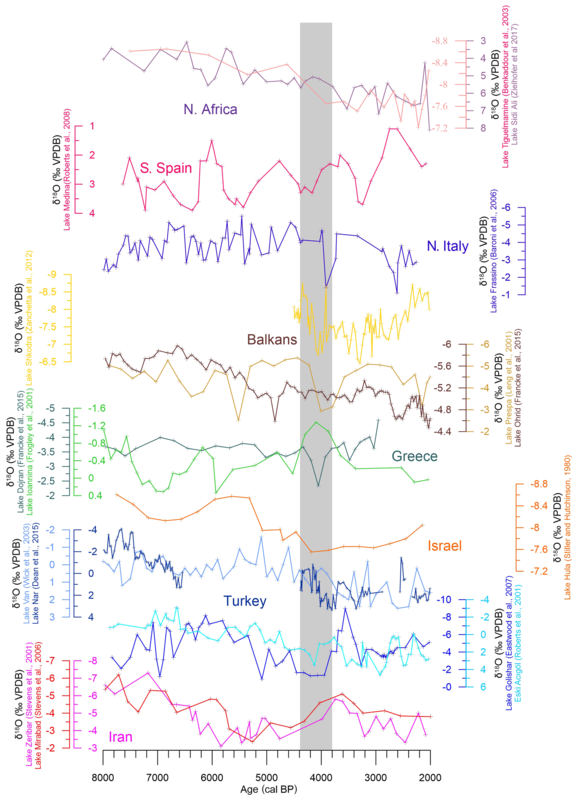 Bar-Matthews, M. and Ayalon, A.: Mid-Holocene climate variations revealed by high-resolution speleothems records from Soreq Cave, Israel and their correlation with cultural changes, Holocene, 21, 163–171, 2011. 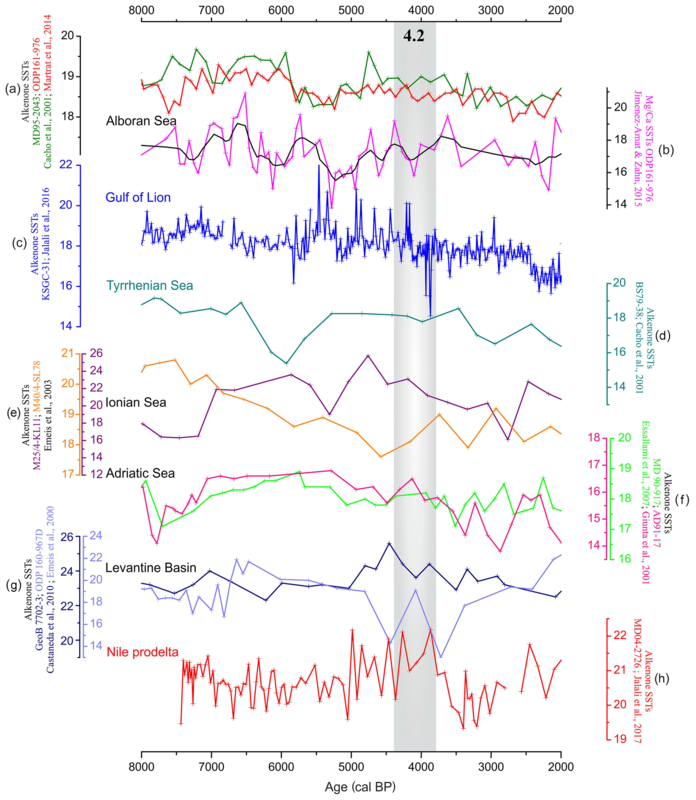 Cacho, I., Grimalt, J. O., Canals, M., Sbaffi, L., Shackleton, N., Schönfeld, J., and Zahn, R.: Variability of the western Mediterranean Sea surface temperature during the last 25 000 years and its connection with the Northern Hemisphere climatic changes, Paleoceanography, 16, 40–52, 2001. Cartier, R., Brisset, E., Guiter, F., Sylvestre, F., Tachikawa, K., Anthony, E. J., Paillès, C., Bruneton, H., Bard, E., and Miramont, C.: Multiproxy analyses of Lake Allos reveal synchronicity and divergence in geosystem dynamics during the Lateglacial/Holocene in the Alps, Quaternary Sci. Rev., 186, 60–77, 2018. Constantin, S., Bojar, A.-V., Lauritzen, S.-E., and Lundberg, J.: Holocene and Late Pleistocene climate in the sub-Mediterranean continental environment: A speleothem record from Poleva Cave (Southern Carpathians, Romania), Palaeogeogr. Palaeocl., 243, 322–338, 2007. 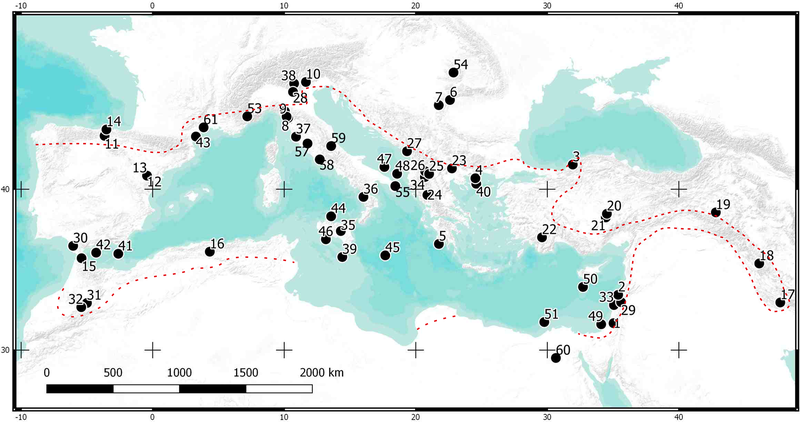 Dean, J. R., Jones, M. D., Leng, M. J., Noble, S. R., Metcalfe, S. E., Sloane, H. J., Sahy, D., Warren, J., Eastwood, W. J., and Roberts, N.: Eastern Mediterranean hydroclimate over the late glacial and Holocene, reconstructed from the sediments of Nar lake, central Turkey, using stable isotopes and carbonate mineralogy, Quaternary Sci. Rev., 124, 162–174, 2015. 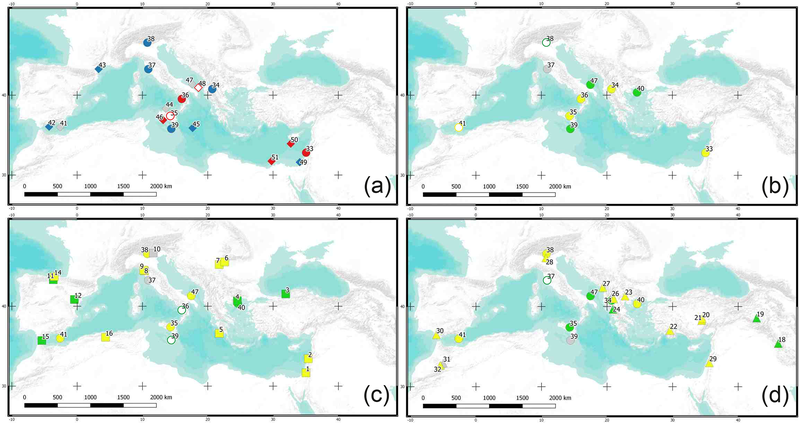 Dormoy, I., Peyron, O., Combourieu Nebout, N., Goring, S., Kotthoff, U., Magny, M., and Pross, J.: Terrestrial climate variability and seasonality changes in the Mediterranean region between 15 000 and 4000 years BP deduced from marine pollen records, Clim. Past, 5, 615–632, https://doi.org/10.5194/cp-5-615-2009, 2009. Duplessy, J. C., Bard, E., Arnold, M., Shackleton, N. J., Duprat, J., and Labeyrie, L. D.: How fast did the ocean-atmosphere system run during the last deglaciation?, Earth Planet. Sc. Lett., 103, 41–54, 1991. Eastwood, W. J., Leng, M. J., Roberts, N., and Davis, B.: Holocene climate change in the eastern Mediterranean region: a comparison of stable isotope and pollen data from Lake Gölhisar, Southwest Turkey, J. Quat. Sci., 22, 327–341, 2007. 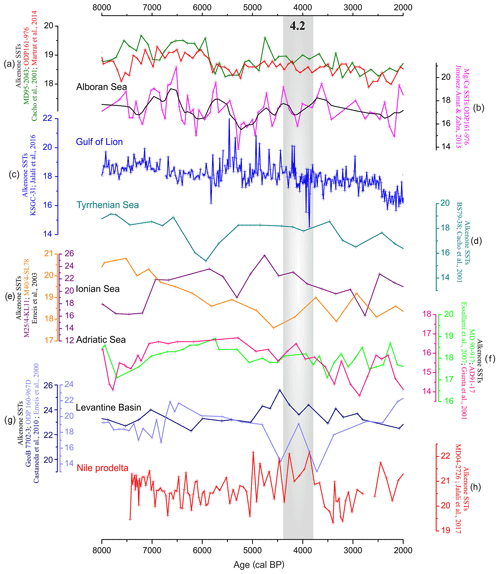 Emeis, K.-C., Struck, U., Schulz, H.-M., Bernasconi, S., Sakamoto, T., and Martinez-Ruiz, F.: Temperature and salinity of Mediterranean Sea surface waters over the last 16 000 years: constraints on the physical environment of S1 sapropel formation based on stable oxygen isotopes and alkenone unsaturation ratios, Palaeogeogr. Palaecol., 158, 259–280, 2000. Fairchild, I. J. and Treble, P.: Trace elements in speleothems as recorders of environmental change, Quaternary Sci. Rev., 28, 449–468, 2009. Fohlmeister, J., Schröder-Ritzrau, A., Scholz, D., Spötl, C., Riechelmann, D. F. C., Mudelsee, M., Wackerbarth, A., Gerdes, A., Riechelmann, S., Immenhauser, A., Richter, D. K., and Mangini, A.: Bunker Cave stalagmites: an archive for central European Holocene climate variability, Clim. Past, 8, 1751–1764, https://doi.org/10.5194/cp-8-1751-2012, 2012. Frigola, J., Moreno, A., Cacho, I., Sierro, F. J., Flores, J. 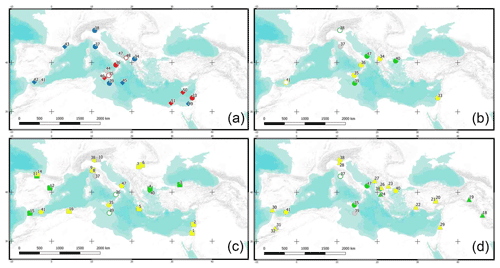 A., Grimalt, J. O., Hodell, D. A., and Curtis, J. H.: Holocene climate variability in the western Mediterranean region from a deepwater sediment record, Paleoceanography, 22, PA2209, https://doi.org/10.1029/2006PA001307, 2007. Frogley, M. R., Griffiths, H. I., and Heaton, T. H. E.: Historical biogeography and Late Quaternary environmental change of Lake Pamvotis, Ioannina (north-western Greece): evidence from ostracods, J. Biogeogr., 28, 745–756, 2001. Gambin, B., Andrieu-Ponel, V., Médail, F., Marriner, N., Peyron, O., Montade, V., Gambin, T., Morhange, C., Belkacem, D., and Djamali, M.: 7300 years of vegetation history and climate for NW Malta: a Holocene perspective, Clim. Past, 12, 273–297, https://doi.org/10.5194/cp-12-273-2016, 2016. Jones, M. D., Leng, M. J., Eastwood, W. J., Keen, D. H., and Turney, C. S. M.: Interpreting stable isotope records from freshwater snail shell carbonate: a Holocene case study from Lake Gölhisar, Turkey, Holocene, 12, 629–634, 2002. Marsicek, J., Shuman, B. N., Bartlein, P. J., Shafer, S., and Brewer, S.: Reconciling divergent trends and millennialvariations in Holocene temperatures, Nature, 554, 92–96, 2018. Martrat, B., Jimenez-Amat, P., Zahn, R., and Grimalt, J.-O. : Similarities and dissimilarities between the last two deglaciations and interglaciations in the North Atlantic region, Quaternary Sci. Rev., 99, 122–134, 2014. Moreno, A., Pérez-Mejías, C., Bartolomé, C., Cacho, I., Stoll, H., Delgado-Huertas, A., Hellstrom, J., Edwards, R. L., and Cheng, H.: New speleothem data from Molinos and Ejulve caves reveal Holocene hydrological variability in northeast Iberia, Quaternary Res., 88, 223–233, 2017. Muñoz, A., Bartolomé, M., Muñoz, A., Sancho, C., Moreno, A., Hellstrom, J. C., Osàcar, M. C., and Chaco, I.: Solar influence and hydrological variability during the Holocene from a speleothem annual record (Molinos Cave, NE Spain), Terra Nova, 27, 300–311, 2015. Piccini, L., Zanchetta, G., Drysdale, R. N., Hellstrom, J., Isola, I., Fallick, A. E., Leone, G., Doveri, M., Mussi, M., Mantelli, F., Molli, G., Lotti, L., Roncioni, A., Regattieri, E., Meccheri, M., and Vaselli, L.: The environmental features of the Monte Corchia cave system (Apuan Alps, central Italy) and their effects on speleothems growths, Int. J. Speleol., 37, 153–173, 2008. Roberts, N., Reed, J., Leng, M. J., Kuzucuoǧlu, C., Fontugne, M., Bertaux, J., Woldring, H., Bottema, S., Black, S., Hunt, E., and Karabiyikoǧlu, M.: The tempo of Holocene climatic change in the eastern Mediterranean region: new high-resolution crater-lake sediment data from central Turkey, Holocene, 11, 721–736, 2001. Sadori, L., Ortu, E., Peyron, O., Zanchetta, G., Vannière, B., Desmet, M., and Magny, M.: The last 7 millennia of vegetation and climate changes at Lago di Pergusa (central Sicily, Italy), Clim. Past, 9, 1969–1984, https://doi.org/10.5194/cp-9-1969-2013, 2013. Sadori, L., Giardini, M., Gliozzi, E., Mazzini, I., Sulpizio, R., van Welden, A., and Zanchetta, G.: Vegetation, climate and environmental history of the last 4500 years at lake Shkodra (Albania/Montenegro), Holocene, 25, 435–444, 2015. 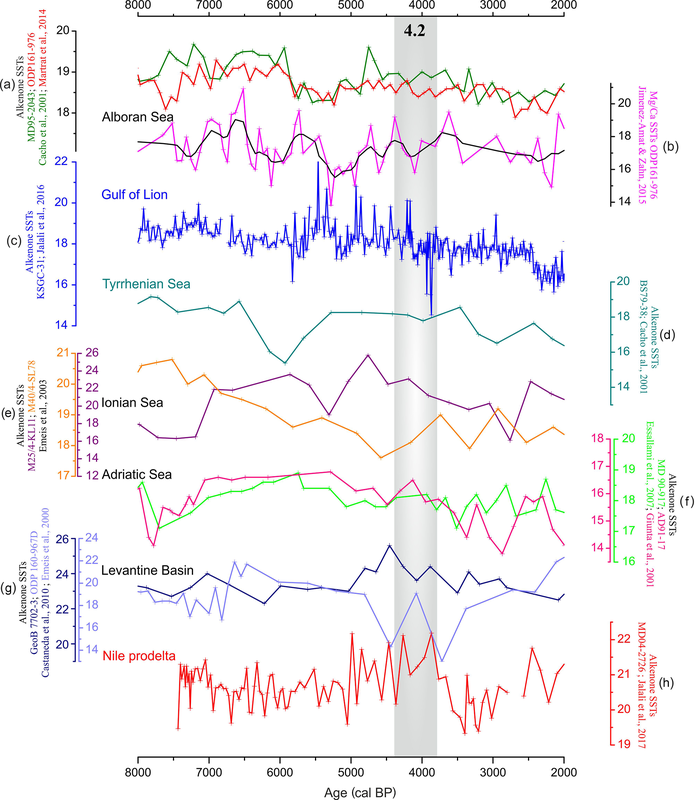 Siani, G., Magny, M., Paterne, M., Debret, M., and Fontugne, M.: Paleohydrology reconstruction and Holocene climate variability in the South Adriatic Sea, Clim. Past, 9, 499–515, https://doi.org/10.5194/cp-9-499-2013, 2013. Stevens, L. R., Wright Jr., H. E., and Ito, E.: Proposed changes in seasonality of climate during the late-glacial and Holocene at Lake Zeribar, Iran, Holocene, 11, 747–756, 2001. Stevens, L. R., Ito, E., Schwalb, A., and Wright Jr., H. E.: Timing of atmospheric precipitation in the Zagros Mountains inferred from a multi-proxy record from Lake Mirabad, Iran, Quaternary Res., 66, 494–500, 2006. Stiller, M. and Hutchinson, G. E.: The Waters of Merom: a study of Lake Huleh VI, Stable isotope composition of carbonates of a 54 m core: paleoclimatic and paleotrophic implications, Arc. Hydrobiol., 89, 275–302, 1980. Tǎmaş, T., Onac, B. P., and Bojar, A. V.: Lateglacial-Middle Holocene stable isotope records in two coeval stalagmites from the Bihor Mountains, NW Romania, Geol. Q., 49, 185–194, 2005. Wick, L., Lemcke, G., and Sturm, M.: Evidence of Late glacial and Holocene climatic change and human impact in eastern Anatolia: high-resolution pollen, charcoal, isotopic and geochemical records from the laminated sediments of Lake Van, Turkey, Holocene 13, 665–675, 2003. Zanchetta, G., Drysdale, R. N., Hellstrom, J. C., Fallick, A. E., Isola, I., Gagan, M. K., and Pareschi, M. T.: Enhanced rainfall in the Western Mediterranean during deposition of sapropel S1: stalagmite evidence from Corchia cave (Central Italy), Quaternary Sci. Rev., 26, 279–286, 2007a.